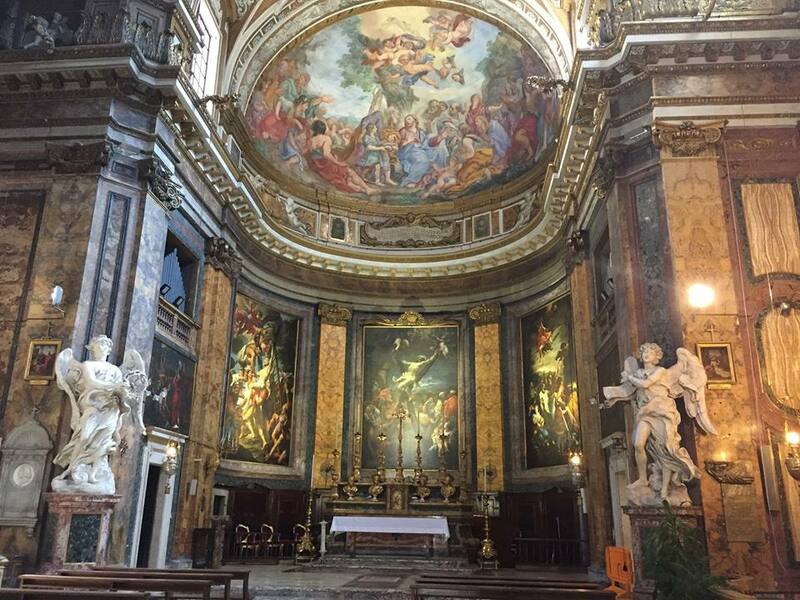 I first visited Sant'Andrea della Fratte looking for two of Bernini's angels that I had read about. These beautiful marble statues had been commissioned by Pope Clement IX and were originally for the Ponte Sant'Angelo. The Angel with the Crown of Thorns and the Angel with the Scroll were part of the original 10 angels designed by Gian Lorenzo Bernini for the Bridge of Angels, but the only two carved by him personally. 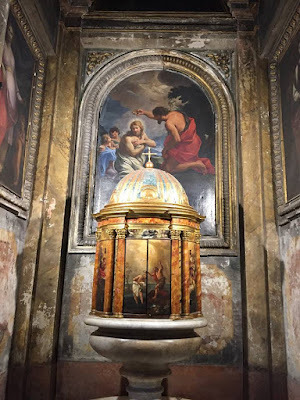 The pope considered these statues to be too precious to be exposed to the elements and were promised to his private collection, later donated to the church in 1729 by Bernini family heirs. 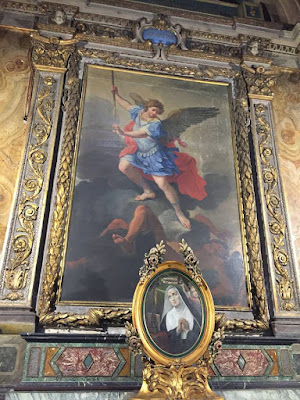 The 17th century church should not only be visited for these two statues of angels but also the richly decorated interior and the three large frescoes of the martyrdom of Saint Andrew the Apostle at the main altar. The Crucifixion by Giovanni Battista Leonardi, the Martyrdom by Lazarro Baldi and the Burial by Francesco Trevisani. Above the door on the side walls are two paintings depicting Saint Andrew by Grecolini. In the apse at the main altar is the Feeding of Five Thousand by Pasquale Marini, he also frescoed the cupola with the Assumption of Our Lady. 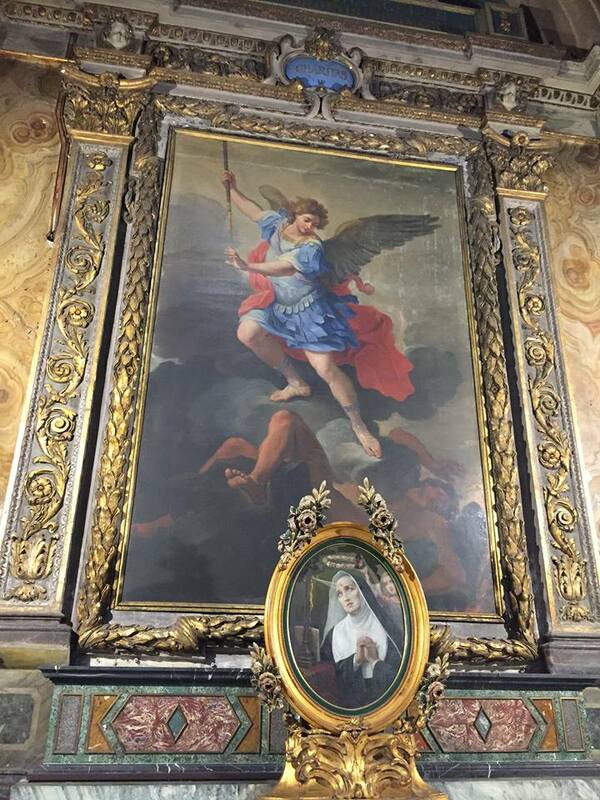 Ludovico Gimignani has three paintings in the church. In the first chapel on the right is the Baptism of Christ, in the next chapel is Saint Michael the Archangel and in the sacristy is the Crucifixion. The friary can also be visited through a door at the right of the church facade. In the cloister are frescoes by Francesco Cozza and Antonio Gherardi showing scenes of the life and miracles of Saint Francis of Paola. It is also interesting to walk around the exterior of the church to look up and see Borromini's white bell-tower.